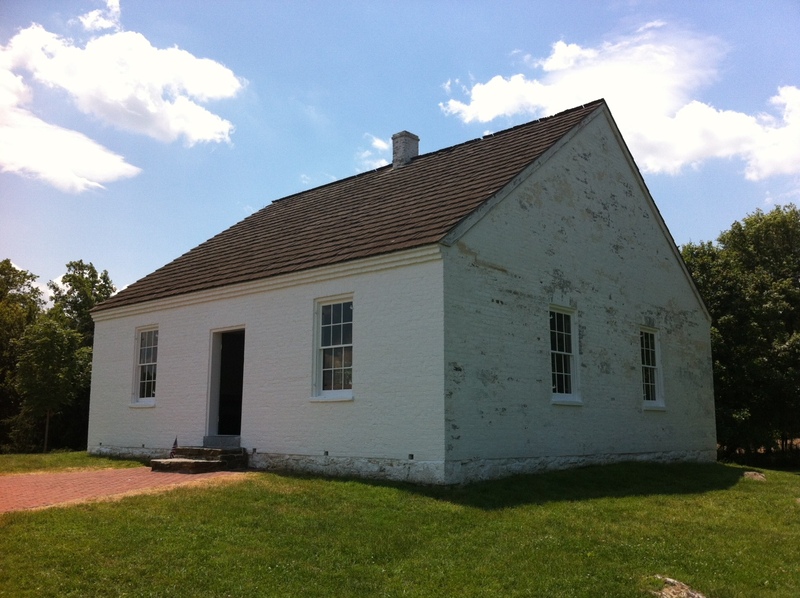 Our visits to historic sites this week made me think of family. At the Eisenhower farm, I thought of Dad, like Ike a military man and a painter. At the Gettysburg battlefield, I recalled an earlier visit with Mom. 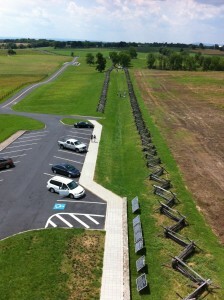 At the Antietam battlefield, I thought of my pacifist brother, Dan. 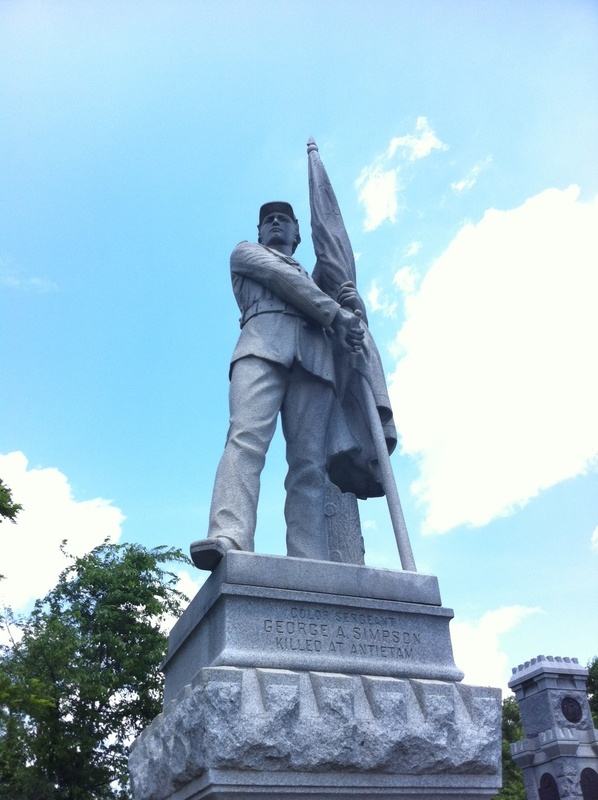 In my last post, I recounted the mixed feelings I felt in Gettysburg, recoiling at the madness of war while admiring the valor of those who fought. But somewhere in a weekend of several hundred monuments at our nation’s two bloodiest battlefields, the madness won out over the valor. I think it was at the Dunker Church. A pacifist Baptist Church in the middle of a battlefield made me think of my pacifist Baptist brother. I come from a family of ministers. Dad was an Air Force chaplain, then an American Baptist pastor. After Dad died in 1978, Mom went to seminary and became an American Baptist minister herself. My younger brother, Don, is a lay minister. He didn’t attend seminary but was ordained by his Southern Baptist congregation after several years as a youth leader. It was my older brother, Dan, whom I thought of as we walked around the Dunker Church, reading the casualty toll on the various unit monuments. We grew up living on and around Air Force bases. Though Dad was peaceful, we grew up with a strong military orientation. For a stretch in the 1960s, Dan’s favorite record was Barry Sadler‘s “Ballads of the Green Berets.” But as Dan grew up and prayed and studied Scripture, he felt called to be a peacemaker. He felt war and violence were immoral. Dan told our father, who had served a career in the military, that he couldn’t join the military, even in a non-violent role such as a chaplain or medic. Dad told Dan that he needed to follow the call of his conscience, even if he heard a different call than Dad did. So the son of an Air Force lieutenant colonel became a peace missionary. He graduated from seminary in time to make it to Dad’s death bed in 1978. Dan has followed the call of his conscience around the world, teaching conflict resolution and peacemaking in Burma, Nagaland, Georgia and more countries than I can count. He’s written books about peacemaking and peacemakers. I thought of Dan again and again as we drove and walked the fields and woods of the bloodiest day in American history (yes, more died at Antietam than on 9/11; Gettysburg was deadlier than Antietam, but its carnage stretched over three days). I wished our nation had more peacemakers and fewer people eager to rush into wars, both in our lifetimes and back when our nation fought this deadly war. I thought of Dan as my companion and I walked past monument after monument — statues and plaques memorializing the brave men who fell in the cornfield and the sunken road known ever since as Bloody Lane. I wondered if there’s a way to honor the courage of the troops who fight wars without glorifying war itself, as the statues and battle scenes on some monuments do. Do we similarly honor the courage of peacemakers? The photos of bodies at Antietam are a stark contrast to the erect soldiers on the Antietam monuments. I think war memorials should honor the dead by reminding the living how war turns peaceful fields like those surrounding Antietam Creek into killing grounds too horrific to imagine.